In the colder months, you may require a little extra help to heat your home and its hard to know whether to choose an Oil Filled Heater vs Electric Heater. Choosing the right portable heater for your home will depend on a number of factors such as the size of the area that requires heating, the versatility you require, and the storage space you have available, amongst other things. There are a huge number of portable heaters on the market, so it can be difficult to know which one will be best suited to your home. In the battle between an oil heater vs electric heater, how will you know which one is going to be the most appropriate choice for you? By looking at the pros and cons of both oil and electric (fan or radiant) heaters, it will make your purchase decision much easier. Oil heaters, otherwise known as oil-filled radiators, are a common form of convection heater. The oil is not used as fuel, but instead as a heat reservoir, that has been heated by an electrical element at the heater’s base. As the oil is warmed, it flows around the open cavities in the heater by convection, producing long-lasting heat. Efficient – An oil-filled radiator has a lower power consumption than electric radiators. This is due to the way they work – the oil inside the radiator is warmed temperature, which heats the metal walls (also known as fins). The large surface area of these walls can heat a large amount of air in a small space of time. Furthermore, when the oil of the radiator reaches its optimum temperature, it shuts off, which greatly reduces running costs. Longer Lasting Warmth – The large surface area of oil heaters, meaning that compared to electric heaters, a greater volume of air in contact with the heat source at any one time. This means a room will heat up relatively quickly, and keep the air around them warmer for longer periods. An oil heater will give long-lasting warmth for relatively low energy consumption, and the warmth of the heater will remain for some time after the heater has been turned off. Quiet – Oil heaters are very quiet as once the oil reaches its optimum temperature, it does not have to work very hard to continue running efficiently. Furthermore, there are no moving parts that create noise, like the fans in electric heaters. 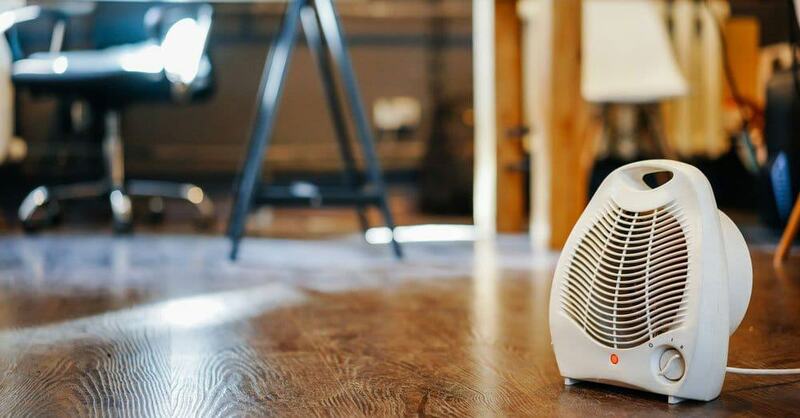 Low Environmental Impact – Neither type of portable heater pose a significant environmental impact, with oil-filled radiators the impact is very low, as they have a low energy expenditure. Furthermore, the oil within a heater will remain effective for many years, and will not require topping up in any way. However, as the oil within these heaters is a toxic substance, it should always be disposed of properly. Slow to Warm – Compared to electric heaters, oil heaters tend to be slow to warm as they rely on the liquid oil to be heated, before the heat is transferred the metal walls, and then to the air through radiation. Just as they are slow to warm, they are also slow to cool down, which can be a problem if there are small children that may touch them. Heavy – Oil heaters will tend to be much heavier than an electrical heater of a similar size. This will make them cumbersome to move around from room to room, and when it comes to putting them away for storage. They are so heavy, as they are filled with a viscous liquid and require a durable build to prevent oil from escaping, and a large surface area of metal for efficient heating of a room. Not Suitable for Larger Spaces – Oil radiators are not ideal when it comes to heating larger rooms an spaces. Whilst they will heat smaller rooms effectively and for long periods of time, as there is no airflow helping to spread the heat (like a fan electric heater has) around the room, they don’t work so well in larger spaces. In really large rooms, the heat will really struggle to distribute and their effects may be minimal. Portable electric heaters are designed to heat small areas and rooms and produce their heat through a heating element, usually made of metal or ceramic. They are usually divided into two categories: those without a fan, and those with a fan. Those with a fan, help to spread warmed air throughout a room, quicker than electrical heaters without a fan. Quick to Heat – Where it takes a while for an oil heater to reach its top temperature, with an electric heater, the warmth is noticeable within a few moments. Furthermore, many space heaters are equipped with a fan, which will blow out the heat, warming up an entire room in just a few minutes. This makes the electric fan the perfect option for short-term heating, as their results are almost instant, and they can be directed easily towards an area that requires heat. Lightweight, versatile and Portable – As electric heaters, don’t need to be as robustly built at oil-filled heaters, they are much lighter and therefore have greater portability. Furthermore, as they have no heavy liquids flowing through them, just electricity, they can be moved easily from room to room. Oscillation and Directed Heating – Some electric heaters even have an oscillating feature, which means that heat can be spread into every corner of the room fairly quickly. Furthermore, many electric heaters can be directed to different areas of the room, even upwards. No Power, No Heat – Although they are quick to heat, once the heater is turned off the heat will quickly dissipate. 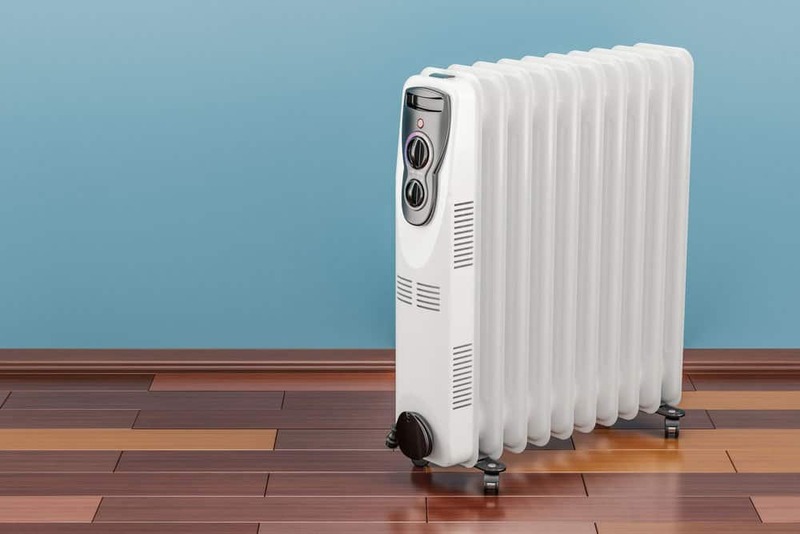 The elements of an electric heater, do not hold their heat as well as an oil-filled radiator, which retains quite a lot of heat, long after they have been switched off. Safety Concerns – There are a number of safety issues that can arise with electrical heaters. In electrical heaters with an exposed electrical element, there is a fire risk, particularly if they are placed next to flammable items, such as curtains or soft furnishings. Furthermore, compared to oil heaters, electrical heaters are significantly hotter to the touch, presenting a higher burn risk. Finally, as electric heaters are of a higher voltage, they can be rather dangerous if they come into contact with water, and therefore should be kept out of the kitchen and bathroom. Check out our complete guide to oil filled heater safety. Produce a lot of Noise – Compared to their almost silent oil counterparts, electrical heaters can be rather noisy, potentially disturbing an otherwise peaceful night at home. Their excess noise is a result of the electric heater’s need to constantly work (e.g. the fan to constantly run) to keep heat pumping around the room. Costly to Run – Although there are variations in how much each time of electric heater will cost to run, they tend to be more expensive than oil heaters. Electric heaters require a constant charge to continue providing heat, meaning a constant energy expenditure, which means they can be costly to run if used for more than a short period of time. Require Maintenance – In electric heaters, particularly in those with fan mechanisms, dust can be an issue, which can affect its efficiency. If dust accumulates, the airflow through the heater could slow down, which may result in the heating element becoming so hot that it fractures. So if you do choose an electrical heater, make sure you follow the manufacturer’s maintenance guidelines. Portable heaters are always a smart purchase, as it can save the cost of heating a whole house when you only need to warm up a single room in your home. Although, not a significant purchase, you should be sure that you are choosing the right one for your needs. In conclusion, oil heaters are best suited to small rooms, where they will be used for longer periods of time. Electric heaters are better suited if you need something more portable and versatile, in rooms where you want to control where the heat is directed.